Hullo! Welcome! Please help yourself to a complimentary cheesy nibbly thing! We are the New Fat Ladies and this is our Very First Post! In what is probably a fairly good indicator of what is to come, I am now going to attempt to write up our Very First Recipe . . . which we made six weeks ago. THINGS HAPPENED, OK?! WE GOT BUSY! YOU’RE NOT THE BOSS OF US! I mean, um, we are totally going to get better at this ‘blog as you go’ thing otherwise this is likely to not only be the Very First Post but also the Only Post. Apologies for iPhone photos. We had a slight mishap with our many, many other photos and these are what we have left. Thank goodness for Instagram and our obsessive blogging of every second of our lives. Katie and I know each other through a mutual friend, Jen (who is about to start performing at the Edinburgh Fringe! You should go and see her show if you are there!). We bonded over Camp Rock and food and being generally fairly awesome. This past summer, Katie joined Aquaporko, the fat synchronised swimming team that I am in and also moved to live one suburb over. Thus, many cookings and talkings about food were made. And then the brainwave: if you blog with another person, you probably need to have some sort of responsibility (sorry, poor neglected solo blog). If only these were slightly more in focus . . .
Pears! Pears are in season! PEARS AND CHOCOLATE! PATE SUCRE! CHAMBORD! OMFG! Please try and ignore the delicious icebox cake that is also on that plate. Yes, we did need a backup dessert. Full disclosure: we weren’t huge fans of this pastry at all. It was very dense and made way too much. If you halved (or even thirded) it, it would probably be the light, crispy pastry of our dreams. All the other bits are ace, though. Remove the dough from the refrigerator, sprinkle a clean work surface with flour and cocoa and roll the dough out in a circle to hang over the edges of your tart tin. Ours was approx 2/3cm thick but this was probably a bit too thick. Place in your tin and trim excess. This was the point when we realised that this made enough pastry for two tart shells. Bake the tart in the oven for 12 minutes and allow to cool completely before adding the filling mixture. Melt the butter in a medium sized saucepan over a medium-high heat until bubbly and golden. Add the sugared pears and caramelize for 6 minutes on the first side and 2 minutes on the second side. With our second batch of pears, we added a bit more butter and they really only need 2 minutes each side. Add the Chambord, remaining sugar, water, raspberries, cordial and lemon juice. Cover, reduce the heat to medium and let simmer for 15 – 20 minutes basting and turning pears, as needed. Poach until tender, remove the pears and cool. Reduce liquid until thickened, coating the back of a spoon, making it a delicious Chambord-y jelly. Push jelly through a mesh strainer to remove the raspberry seeds. Cool and reserve. Combine chocolate and cream in a saucepan and stir over medium heat until melted. Combine yolks and sugar in a heatproof bowl and whisk over a saucepan of simmering water for 6 minutes or until thick and pale. Remove from heat, fold through chocolate mixture and whisk, using an electric mixer for 6 minutes or until cold. 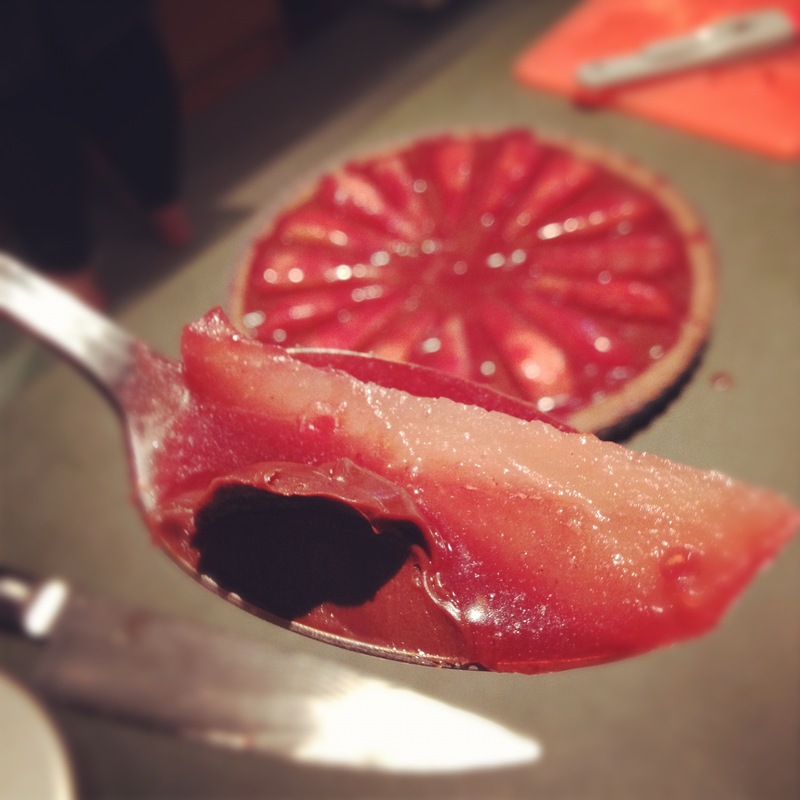 Take your baked and now cooled tart shell and put 2/3 of the Chambord pear jelly in the shell. To quote Katie, “wiggle to coat” and then pop in the freezer for five minutes. When it is done, pour the chocolate ganache in and then, sadly, return it to the fridge until the ganache is set. 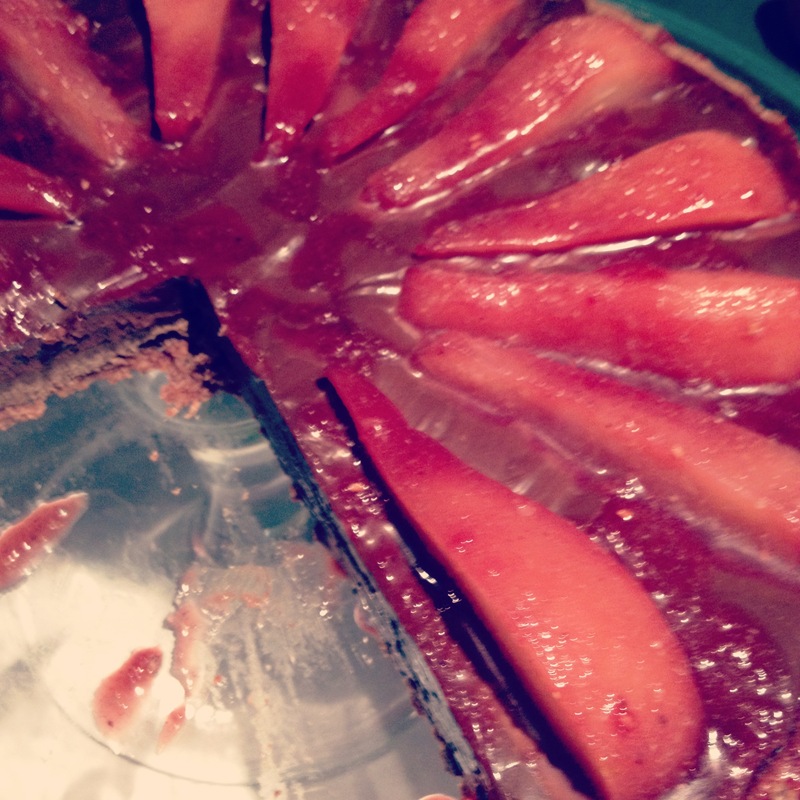 When that is done, arrange the pears on the ganache and glaze the whole lot with what is left of the jelly that you have reheated. Sit back and look at your fabulous tart. And then eat it. Yes, indeed. Secondly, OMG YOU ARE THE WORST FOR MAKING THIS DELICIOUS THING WHEN I AM NOT THERE TO EAT IT AND THEN TAUNT ME WITH THE PHOTOSES! We are fiendish and wicked! Chookas, bb! I just caught myself making biting motions at the screen. 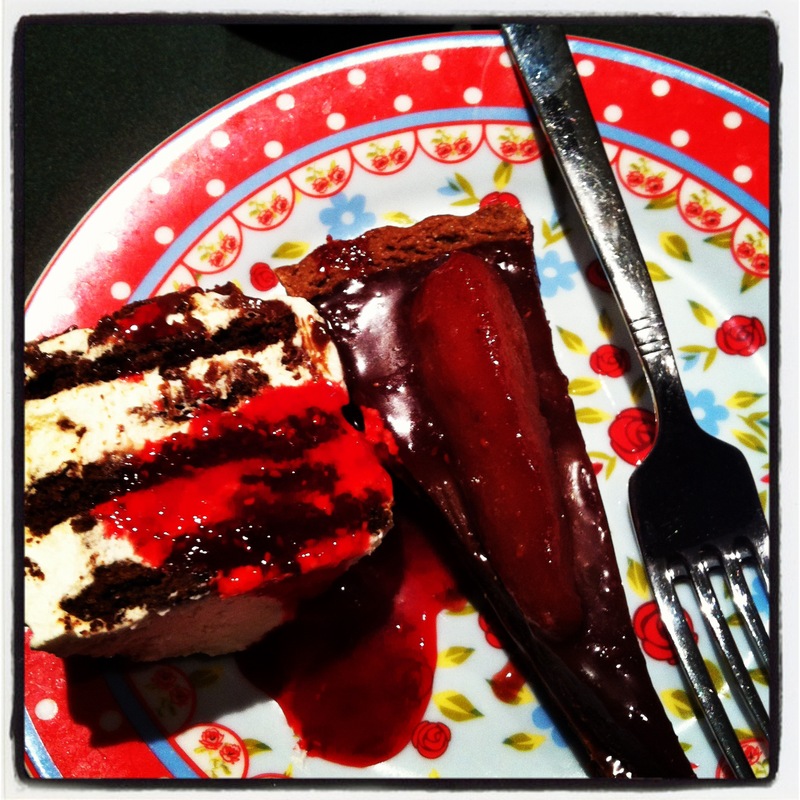 This blog may result in screen destruction as I try to eat things through the interwebs.